When you set up your company in Pandle, you will have entered (or Pandle will have automatically pulled from Companies House) the directors' names. A director's loan account(s) will have then been created as a bank account. This account works in the same way as a bank account but is used to show how much the company owes to (or is owed from) the director. Business expenses incurred by a director personally can be entered here. 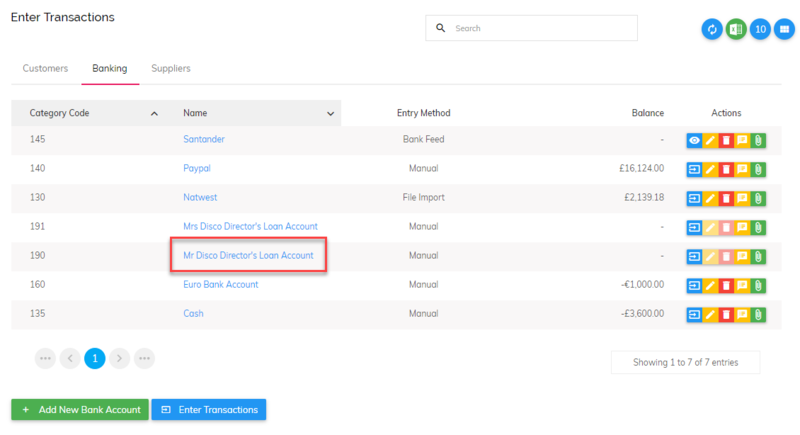 Simply click 'Enter Transactions' next to the relevant director's loan account. In the example above, the transaction shows electricity paid for personally by one of the company directors. This electricity expense will be included in the Pandle records which will reduce the profit, and will show a director's account of -£240 (the amount the company owes to the director tax free). With a sole trader or partnership the process is slightly different. Let's take the example of a sole trader paying for an electricity bill of £200 + VAT on behalf of the business, i.e. it is paid through their personal bank account which is not included in Pandle. To set this up, go to Enter Transactions > Banking Tab. Click on 'Enter Transactions' for the cash account. Process the expense payment out in one transaction, with another transaction showing the same amount coming in (on the same date) categorised under 'Capital Introduced'. As you can see from the image, the net effect is zero, meaning the cash account balance will not change. The electricity expense will be included in Pandle and £240 will show as introduced from the owner/partner.